Vinyl is the most popular siding material on the market, thanks to its durability, affordability, and minimal maintenance. Vinyl siding is also tremendously diverse, rivaling natural or fiber cement products at a fraction of the cost. Here's a quick guide to the most common vinyl siding styles. The following vinyl siding styles are among the most popular. 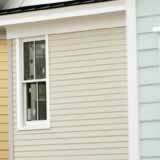 Clapboard vinyl siding. The most common vinyl siding style. A traditional vinyl siding product constructed of horizontal boards appearing to overlap. Board and batten vinyl siding. Board and batten siding is formed by alternating wide boards with narrow strips called battens. Insulated vinyl siding. Insulated vinyl siding is a premium product that uses some insulating material, often foam, to improve your homes R-Value. According to the New York State Energy and Research Development Authority, insulated vinyl can reduce your energy bill by about $50 per month. Wood, cedar, or log vinyl siding. As their names suggest, wood, cedar, or log vinyl siding mimics natural wood, but is more durable and costs less. Brick vinyl siding. Brick vinyl siding mimics real brick and is typically hung in large panels. Vinyl shingles. Vinyl shingles consist of overlapping vinyl shapes, such as rectangular or half-round. Vinyl shakes. Vinyl shakes mimic shingles of split wood--typically cedar. Beaded vinyl siding. Beaded vinyl siding has a beaded (protruding) seam that accentuates the board's lines, providing a very clean, traditional look. How Do Vinyl Siding Styles Influence Cost? As a general rule, the more difficult it is to fabricate and install a particular style of vinyl siding, the more expensive it is. Vinyl shakes and shingles, for example, cost more than the most common vinyl siding styles such as clapboard. Insulation adds about $1 per square foot to your final cost, while thicker, premium siding products can add as much as $5 or $6. Higher prices don't always mean higher quality, however, so be sure to request more than one professional estimate to compare.